John McDonnell and newly-elected Labour MPs will line up alongside musicians such as Soweto Kinch for the Momentum festival of ideas at Labour Party conference. The shadow chancellor is one of a group of left-wing activists who will celebrate Labour’s “extraordinary electoral comeback” this year and set out what a government led by Jeremy Corbyn could deliver. The second annual World Transformed event, hosted by Momentum, will take place in Brighton alongside Labour conference. More than 200 speakers will take part in the four day festival of politics, music and art, which will include backbencher Lisa Nandy, shadow attorney-general Shami Chakrabarti and veteran and author Harry Leslie Smith, as well as David Thacker, a theatre director, and Kinch, a Mercury Music Prize nominated jazz and hip-hop artist. 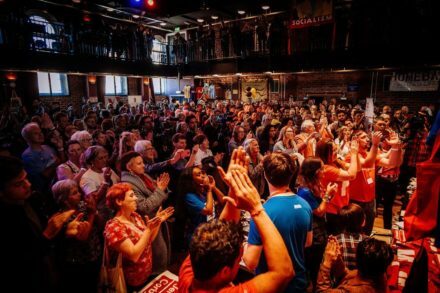 It follows the first World Transformed gathering last year, which coincided with Labour Party conference in Liverpool, and prompted strong attendance by left-wing activists but groans from some centre-left MPs, who saw it as an alternative to the party’s conference following 12 months of turmoil. Today Corbyn said the second incarnation of the festival would “complement” party conference rather than act as a rival. “The World Transformed has shown itself to be a powerful new space on the Labour Party conference fringe for people to debate policies, exchange ideas, and expand our political horizon with arts, music and culture,” Corbyn said. Organisers poured scorn on the plans of Tory MP George Freeman who last week said he wanted to run a Conservative Ideas Festival – dubbed a “Tory Glastonbury” – but which would be invite-only. “Unlike George Freeman’s ‘Conservative Glastonbury’, our city wide festival will be open to the public, attract thousands of visitors and span nine venues across Brighton,” said Anastasia Palikeras.